As a club, we first heard about Bike Bath shortly before our AGM last December. We received a clearly scripted communication from the organisers stating how the event would benefit local clubs and so on….The problem was it didn’t state how. We were also asked to provide details of how we could help with the event. Naturally we were very sceptical but decided at our AGM to at least put forward a proposal of organising some training rides in the lead-up to the event. Time passed and we slowly got to know Richard through his work with Bath Cycle Races. Of course, our series offered a great opportunity to advertise and also tap into local knowledge and contacts. We were still sceptical but in turn Richard helped with promotion, setting up and dismantling the course each week along with providing storage for our event signs and other vital elements. Bath Cycle Races was better for the help we received this year. Turnout was less than 10 riders each week but the same riders kept coming back for more…..Hopefully everybody learnt a lot. The overriding benefit to the club was to appreciate why many riders are hesitant about joining club runs etc. There’s a large pool of riders out there doing many solo rides just itching to have a go but never making the jump to join a club run. All those who rode were just amazed at how much fun riding in a group is. Food for thought indeed…. We will endeavour to do more of the same in 2013. The event itself started on Friday night with 3 guest speakers at the Pavilion plus a pasta supper. 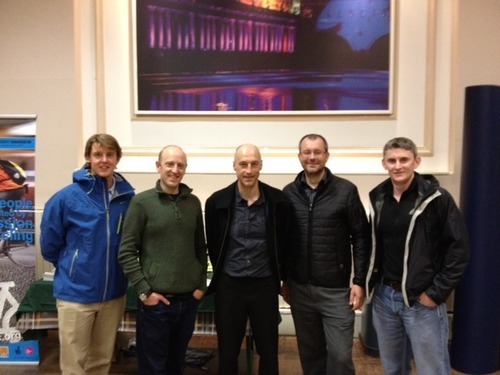 Rob Penn, Ben Rockett and Graeme Obree plus some beer added to the mix made for a great evening. It got even better when Jon an I adjourned to the pub after the event accompanied by Graeme Obree plus Ben Rockett and Tony Solon. Ever so slightly bizarre? You bet! We now know, however, how eating Hartley’s Jelly and wearing brogues instead of cycling specific shoes can help for ultra distance riding. Mr Obree will break the land speed record. “That record, I’m having it!” Plus 19mm tyres are not faster than 23mm ones, fact. There were other gems of knowledge which have been lost to the brain cells killed by the extra pints of Guiness. Apologies. Becci Sutton: http://www.resartwork.com/?p=151 Chapeau to Becci especially for riding back-to-back centuries! A great first year all in all but plenty to build on for next year to make this one of the iconic sportive weekends in the cycling calendar. Over to you Bike Bath…..